As a new mom I am always on the hunt for products that will make my life a little easier, and make Evangeline’s life a little happier. Overall, I would say that this experience of being a mom (though it’s only been nearly 5 months) has been more fulfilling and enjoyable than I could have ever imagined. Maybe it’s because of my previous loss that I appreciate having a baby more, or because she is just so darn adorable – I’m not sure – but I am obsessed! I will say that one of the trickiest parts of having a newborn/infant is being able to multi-task. I know for myself, my responsibilities for my business and in my home did not just stop once she was born. I had to be creative with ways to care for her and also get jobs done. 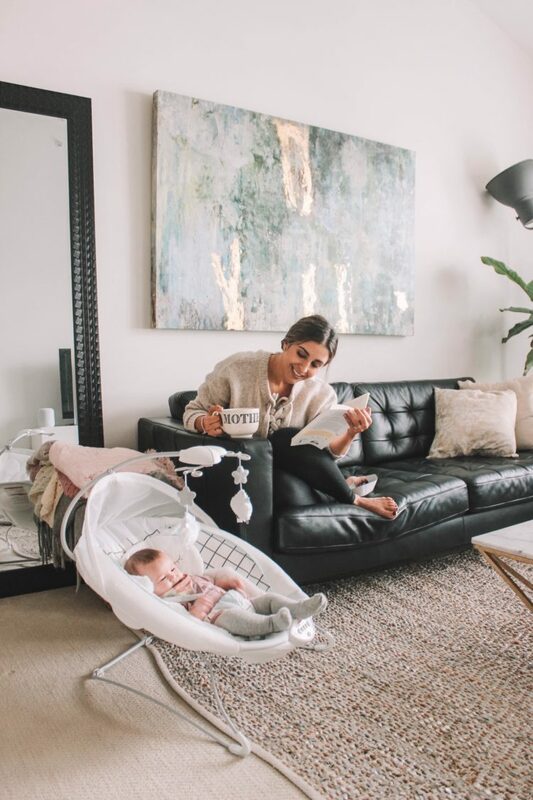 I’ve partnered with Babies“R”Us Canada to give HONEST product reviews for new moms or moms looking to nail down which products are necessary and which aren’t, since there are SO many products out there. This month, I am reviewing the Fisher-Price My Sweet Little Lamb Deluxe Bouncer. In my opinion, this product is perfect for the first 0 – 6/7 months. Evangeline always wants to be watching me but can’t crawl or move around too much on her own. The deluxe bouncer is super comfortable with it’s soft, washable lamb inserts. It engages your baby’s sensory development with its soothing vibrations, sounds, and overhead lamb mobile that assists your baby with eye tracking. 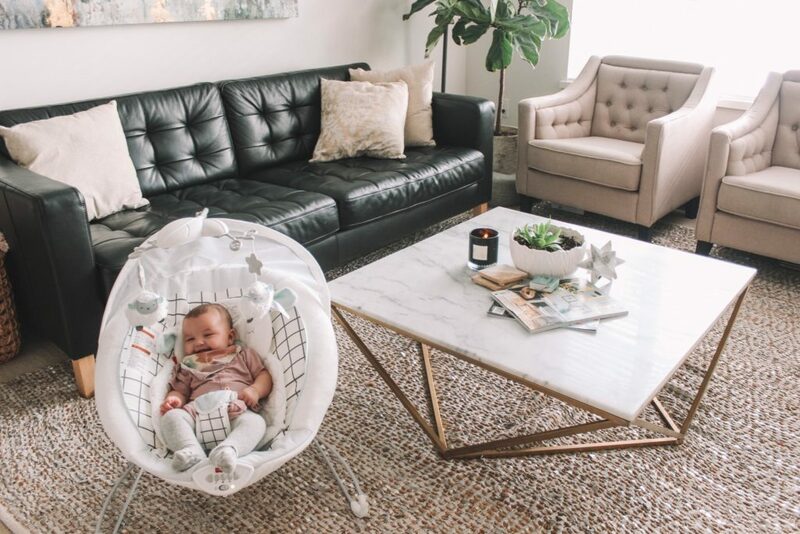 What I love most about the Fisher-Price My Sweet Little Lamb Deluxe Bouncer is that it is very light weight, and is wireless, which means I can carry it around my home very easily. I seriously use it all the time (like right now for instance), or when I’m in the shower and want her to be near to me, in the kitchen cooking or just sitting on my couch reading a book. I don’t have any negative reviews about this product, but you should know that if your baby is not very active you will need to assist with the bouncing. If I feel like she needs some more stimulation or movement, I will place my foot on the bouncer and manually bounce it myself. You can purchase your Fisher-Price My Sweet Little Lamb Deluxe Bouncer at Babies“R”Us Canada for a reasonable price of $89.99 CND. I want to hear your thoughts on this product. Have you used this bouncer or any bouncer before? Do you think it’s a necessary item on a baby registry? Comment below!